Photo Writing - Exploring Photography. : Free Images?!?! - A Commentary on Getty’s ‘Embed’ Feature. However, since this is a page about photography for photographers, let’s consider the ramifications for photographers selling their work through Getty and put aside for a moment the enormous implications for end-users’ privacy and the future of online image sharing. Looking at my own images on Getty I found that only those on the Photodisc collection were available for embed. These are Royalty-Free (RF) images, but this doesn’t mean that all RF images are available for embed. RF images of mine on the Stockbyte collection did not have the embed tag, neither did any of the images on the Stone and Gallo collections. This of course does not mean that this will remain the case indefinitely. From what I could find, none of my Rights-Managed (RM) images had the embed feature. The terms are actually quite reasonable if you assume for the moment that images are only going to be used by the likes of individuals not making money from the imagery and who are trying to further the journalistic enterprise. Getty have very squarely targeted this resource toward users that in the past would not have paid for images to start with. If they even used the images, they would have been effectively pirated (the inglorious screen grab). Of course, what does this mean for newspapers and news agencies? Can media houses now access imagery for free, thereby bypassing the requirement for staff photographers or licencing from free-lancers (The Chicago Sun Times owners would wet themselves with excitement were this the case)? Theoretically, and according to Getty, recent photojournalism is not included in this new outlay of free imagery. This means that if you are covering a news event and licencing the imagery to Getty, any news agency licencing this imagery in turn will have to pay for it. However, older imagery may not have this same protection. In the past, where a photographer would have received royalties for older file images being used, the end-users could now potentially embed the image rather than pay for a licence. Another reason why news agencies are unlikely to benefit from the new embed feature is the simple issue of the iframes protocol. This is essentially an empty box with a link to the image on Getty. That image could change, disappear or - as the cynics point out - turn into an advertisement. A news story needs to always have the content remain the same. In researching this story a number of sites that were demonstrating the new iframe showed the recognisable ‘content not available’ or ‘server not found’ block where there should have been an image linked to Getty. Enough of those blocks pop up and you start to lose readership. So why have Getty done this? In essence it’s a calculated risk for the image giant. It’s true that they have been accused in the past of trampling over photographers’ rights and having only a self-serving agenda, but this doesn’t strike me as the same as their ‘take-it-or-leave-it’ approach to photographer royalties and their massacre of photographers’ incomes with the advent of RF imagery. This, to me at any rate, is a desperate attempt not to be left behind as the world slides towards web v3.0. Social media sites have come to define the web experience, and imagery is part of that experience. Millions of images are ‘shared’ hourly across platforms such as Tumblr, Twitter and Facebook. Keeping track of these images is a virtually impossible task. I would suggest that actually litigating against copyright transgressors - something which Getty have been extremely active with in the past - particularly the one-man-band bloggers and tweeters IS an impossible task. Up until now, any blogger requiring an image could simply screen-grab and host from their own site. I have found images of my own even appear with my watermark, but next to text claiming that they were created by the writer (who clearly screen-grabbed and stole the image). Getty is trying to get in on the social media scene by allowing users to embed an image which continues to be hosted by Getty. This hopefully begins to inculcate a better respect towards images and creators of those images. If a user can access an embedded image for free, and legally, they might be more likely to pay for a non-embedded image, or so the theory goes. In an interview with the guardian, Benji Lanyado, founder of image marketplace Picfair, surmised that Getty’s motivation was such: “People who were previously not paying for Getty images, and were never going to… now do not need to pay for Getty images. Instead of chasing infringers, Getty is offering them a deal” (link). In essence, exposure is the goal for Getty. A vast number of people loading sites and sharing images do so with little or no awareness of copyright issues. The same was true of the music industry a couple of years ago. Apple managed to if not reverse, at least staunch the free flow bleed of income that the music industry was losing to free and illegal downloads of albums. Itunes has made it easy for internet users to buy music online, at what seems to be reasonable pricing (in reality we still pay the same for the music, but are not paying for the whole album, only a part of it). 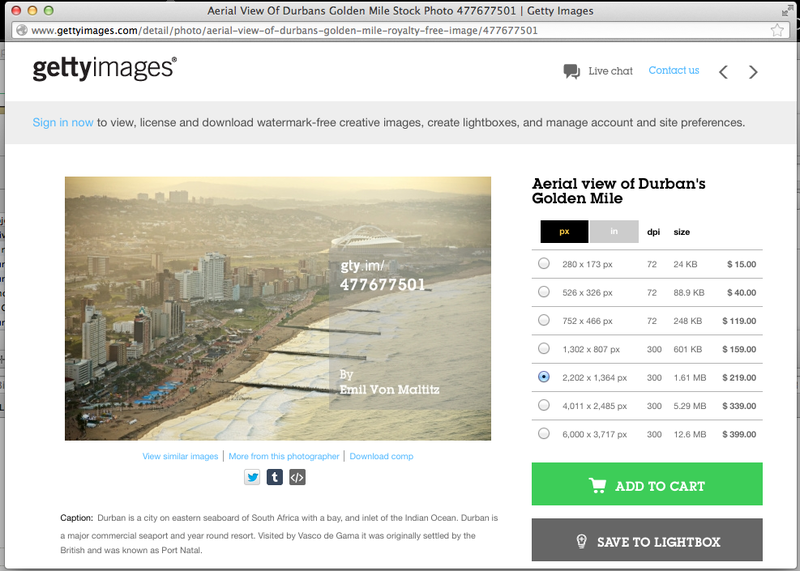 Some might argue that microstock is the industry’s response to outright theft of imagery. Personally I think that microstock was a pricing disaster that Getty was badly injured by. Their repeated attempts to realign collections and even make iStockphoto more upmarket, is a sign that they are trying to regain some of the financial value that imagery lost thanks to microstock. Essentially microstock meant a race to the bottom of the barrel in terms of pricing. As much as photographers might demonize Getty for having colluded in the awful birth of microstock, they were just as badly hurt as photographers (they just have immensely deeper pockets compared to the individual photographer trying to make a living). Back to the music industry where one can draw some correlations. Stock music sites (anyone doing film looking for background tracks will have used these agencies - essentially the same as photo libraries, but selling licenses to original scores and music rather than images) often offer scores for free so long as there is a credit line to the artist and agency in the credits or that the license is specifically for social media or YouTube. The realization is that many indie film-makers producing YouTube videos simply do not have budgets to pay for music. BUT, when said film-maker is commissioned to make a film, they are more likely to buy the score and not have to place the credit line (I am currently in a similar situation where a client is requiring a time-lapse for which I will license, for a fee, a background track). In the burgeoning world of social media it is about making relationships. Getty’s calculated gamble is to make better relationships with future buyers, and at the same time potentially educate them as to image usage. It must be pointed out that photographers are habitual whingers. Put a group of photographers into a room and you are likely to end up with a focused complaint group. People are also naturally averse to change. This is a significant problem if the industry you are in is going through a dramatic change in it’s landscape and is vulnerable to even more seismic shifts in its near future. Adapt or die. Getty is trying to adapt. A comment by Don Giannatti over at Lighting-Essentials.com puts this issue over stock photography and lost income rather neatly, “The fear that photographers have over losing what they had is misplaced. It is already gone.” The horse bolted long ago with the advent of digital photography and the introduction of Royalty Free. Micro-stock just added a nail to the coffin. Once upon a time it was possible to make a decent living selling stock imagery. That time has passed. Adapt or be penniless. As ideas go, I am not entirely averse to the move that Getty has made, with some caveats of course. Ultimately my biggest concern is the very real risk that Getty have further devalued imagery. This is particularly ironic since imagery is becoming extraordinarily important in the way we experience and communicate in new media. It is true that new media has turned more people into voracious readers than ever before, but it is imagery that grabs the readers to start with. I would suggest that imagery has become more entwined with text after the explosion of the internet than before. We have all become glutinous consumers of photographic images. We post, tweet, share, like and watch images on a scale never before seen. Let’s hope that with all this consumption that Getty and the viewing public don’t forget the people who created these images in the first place. A thousand embeds and a million likes won’t feed a family.